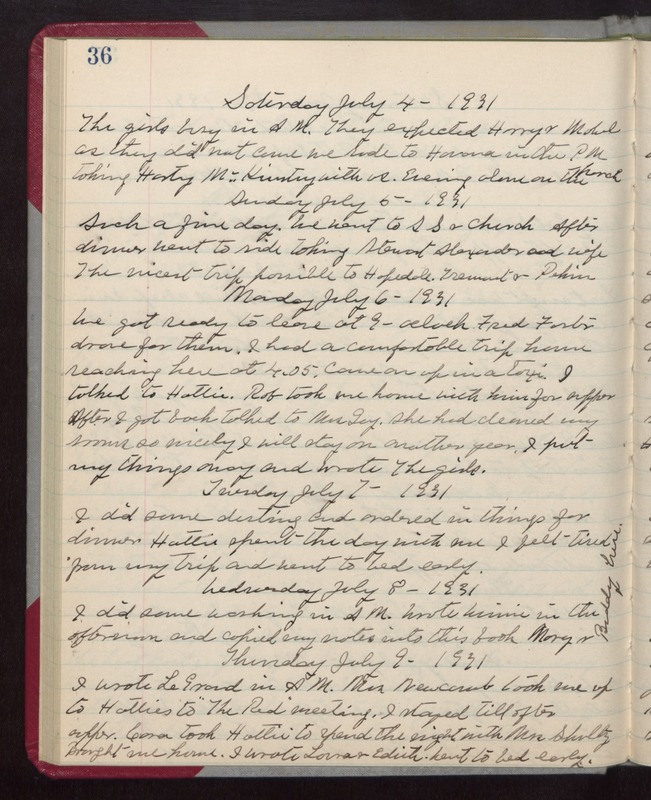 Saturday July 4- 1931 The girls busy in AM. They expected Harry & Mabel as they did not come we rode to Havana in the PM taking [Harty] Mc[Kinstey?] with us. Evening alone on the porch Sunday July 5- 1931 Such a fine day. We went to SS & Church After dinner went to ride taking Stewart Alexander and wife The nicest trip possible to Hopedale. Tremont & Pekin. Monday July 6- 1931 We got ready to leave at 9- oclock. Fred Foster drove for them. I had a comfortable trip home reaching here at 4.05. Came on up in a taxi. I talked to Hattie. Rob took me home with him for supper After I got back talked to Mrs Gay. She had cleaned my rooms so nicely I will stay on another year. I put my things away and wrote The girls. Tuesday July 7- 1931 i did some dusting and ordered in things for dinner. Hattie spent the day with me I felt tired from my trip and went to bed early. Wednesday July 8- 1931 I did some washing in AM. Wrote Winnie in the afternoon and copied my notes into this book Mary & Buddy here. Thursday July 9- 1931 I wrote LeGrand in AM. Mrs Newcomb took me up to Hatties to "The Red" meeting. I stayed till after supper. Cora took Hattie to spend the night with Mrs Shultz Brought me home. I wrote Laura & Edith. Went to bed early.